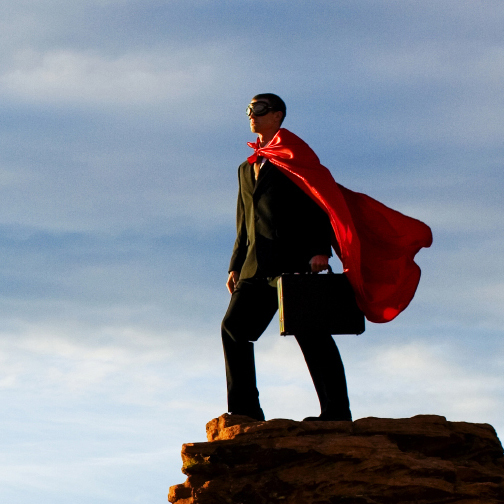 According to Jeff Patton, the ideal product owner (PO) would be a super hero, complete with cape and spandex, though he says that these super heroes are extremely difficult to find, perhaps even mythical. I do not claim to be that guy (yet), so my blog title is…aspirational. But I will say that I am going at this PO thing 1,000% with every waking hour. I read about 50 books a year on everything from leadership, to programming, to usability (among other topics). I am not a programmer but I am working through two books on Objective-C development to learn about object oriented programming (OOP) as well as reading Apple’s Human Interface Guidelines to understand their unique perspective on application design. I will also be coding some experimental applications to have a bit of fun with this new info. As chief product owner, I am working to develop financial analysis, collaboration, and calendaring software with a team of three product owners. They are all in their first year as POs so I have TWICE as much experience…umm, anyway we aspire to become a high performing team. But as I say to them and myself, “Interest is not the same thing as ability,” and that is where my high intensity learning program starts. This blog is about sharing lessons with you, my fellow POs, because it wasn’t so long ago that I went looking for this kind of information. I couldn’t find it, but apparently that was just because I hadn’t written it yet. The unbreakable part of my blog name comes from that great M. Night Shyamalan movie where the entire movie is our hero discovering he has super powers. That’s what we are all striving for as product owners right? And in keeping with the heroes theme, I am going to structure my publications like the Heroes TV show. That is, once a week I’ll post the main lesson I have learned with my team that drives the plot forward but there will be those ‘in between’ episodes where I am doing quick reviews of books, conferences, etc, that will also help you survive the demands of being an agile PO…and maybe even earn that cape. I love that you’ve aimed for super hero! A PO investigating time to learn about dev and better him/her self with various books is awesome. Could you elaborate more on your team of PO’s and the structure you’re working in? Thanks Sam! It seems we share a common passion for life, so I’m excited you are out there blogging about it too. I work in a team that creates applications for an investment firm. We have three scrum teams, each with a product owner (of course) supporting about 20 applications. These applications cover standard numbers-oriented investment tools as well as a collaboration/discussion platform for our internal research, and even a custom calendar application so our globally distributed investment professionals can always find the company meetings they want to attend, wherever they are in the world. I am pretty macro in my approach in general (have to be considering the volume of work). As requests and projects come in, I help frame the vision with stakeholders and the initial backlog creation. At that point, we discuss in our meta-scrum meeting and one of the product owners takes the project to their team to further define and size it…then execute on it of course. POs and Scrum Masters then keep track of the efforts and manage the story definition, scope changes, etc. I participate as needed in areas like scope negotiation with stakeholders and re-thinking product vision if necessary. Am I elaborating on the right things? Hi UnbreakablePO, I recently came across your blog and have been reading my way through it and it has been very helpful. I recently went through a lay-off and as a result decided i needed a new challenge in life and have made a career change and im not focused on becoming a PO. Any tips or wisdom you can provide for someone with analytical experience but no direct Product Owner experience? Maybe skills/traits things I should highlight on a resume or in an interview. Any advice right now would be helpful, thank you. Hi Miguel, first let me say I wish you the best and I think there are many skills that directly translate from analytical roles. Two areas of education where I see many analysts benefit are Product Management and User Stories. Product Ownership *should* be a strategic role where you are looking at the full life cycle of a product. Check out Pragmatic Marketing – their framework on product management shows a strategic view of that. Also definitely check out Jeff Patton’s User Story Mapping. It goes far beyond it’s title into the principles and thought process of Product Ownership. Also, if you don’t have experience with common agile tools-of-the-trade like Jira, familiarize yourself (LinkedIn/Lynda have courses as does Pluralsight). I’ll leave it there for now, but don’t hesitate to reach out as you educate yourself and gain experience!